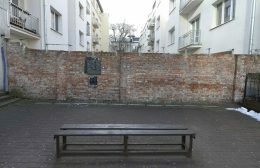 AP Photo/Czarek Sokolowski, File FILE - This Tuesday, Feb. 20, 2018 file photo, shows a fragment of the former Warsaw Ghetto wall in Sienna 53 street in Warsaw, Poland. The wall was built in 1940, when the Nazi Germans closed the area of Warsaw they called the "Jewish district." Poland’s government is distancing itself from comments made by the prime minister’s father, who claimed Jews willingly entered ghettos during the German occupation of Poland to escape their non-Jewish neighbors. In May 2014, I visited Poland to see the death camps on a trip that felt more like a pilgrimage. I wanted to see the places where my grandmother was imprisoned and starved, her family murdered and mutilated. Before I saw the quiet barracks of Auschwitz, however, I would visit Majdanek, a death camp in Lublin, Poland. At the top of a hill, on the far side of the camp, is a large dome, the monument to its victims. The monument is a mausoleum. It is quite enormous. But when one approaches it, and peers down into the large pit that is covered by the dome, it feels tiny and claustrophobic. Within this pit is a great black mound — really a small hill — made up of the ash of cremated victims, dirt and human bones. On that day, when I saw this, it was quiet all around, leaving us to contemplate the site in silence. I found that this was difficult; close to impossible. It is like contemplating eternity or your own death. The absolute magnitude — the impossible breadth of human destruction — lent the whole of World War II a feeling of mythology, of a great creation and destruction story. In the deep, dark past, a great cataclysm engulfed the entirety of the earth and millions died, and were suffocated, and burned, and entire cities flattened and smashed to dust. A cloth of dark evil was lain across the earth like a burial shroud. But the world stepped back from this brink, or went over but survived the fall, and from the hellfire a new world was born. It was only a little while later, when I had already lived 20, that I began to realize that 70 years was not a long time, that it was far from the deep, dark past. The myth was no myth. And it did not happen in the fog of antiquity or in the great stretch of the eons. It happened yesterday — a generation ago. When I hold the hands of my grandmother, I touch that yesterday, and that world of deep dark evil is revealed as my own — as our own. I have fought with the question of the Holocaust my whole life. I have gone from anger, to despair, to anger again. Sixty-four years ago, my grandmother was sucked into the maw of a giant murderous machine, filled with boiling hatred and iron and fire, operating by well-followed orders and that obedience characteristic of fearful and happy humans. And yet somehow she came out the other side of his monstrosity, alive. Europe in those years was a great slaughterhouse in which tens of millions died. She managed to avoid the fate of her mother and sister and millions others. When looking into her eyes, not all the time, but sometimes, it seems as if she is still there, as if this life was a dream she would soon wake up from and find herself back in that terrible machine. She has told me that the image of her dying mother has not left her, to this day — that this moment in her young life was branded into her cortex, always there, like the spots the sun leave long after you’ve stopped staring into its fiery heart. What to do with the knowledge that my grandmother, my hero and savior, can never forget the image of her own dying mother, and indeed sees and remembers it wherever she goes, even when she looks at me? What to do with a world which, in cruel torture, branded into the mind of a beautiful soul a picture that can only haunt her? My grandmother is 91 and one of the few remaining witnesses to a world gone mad. She cannot help but to remember this time — not as a story, not as a metaphor, but as her life. We are commanded on Yom HaShoah — The Day of the Cataclysm — to remember the Holocaust. Most of the world were not witnesses to the cataclysms of the Holocaust and to the World War. To remember these events implies that we have a handle on them, that we know these things more or less in their entirety. The Holocaust, and the terrible catastrophe of world war, are impossible to know fully and truly. The vastness of the tragedies precludes our understanding. An impenetrable fog stands between us and our questions on one side, and the unknowable answers on the other. This is a frustrating, infuriating experience. “Behold, I cry out: ‘Violence!’ but I am not heard; I cry aloud, but there is no justice,” yelled Job, to no reply. And yet, despite the opacity of the Holocaust, of human evil more generally, still we are asked to remember; if not remember, then merely contemplate. Take a few minutes and contemplate this evil, and the world, and your place within it. This is ultimately our charge — to act against evil, in others yes but more importantly in ourselves, but also to contemplate it in its unknowable mysteriousness. We may receive no reply, like staring into a black mound of ash — but better to cry justice than not at all. Aaron Bondar is a junior double-majoring in political science and economics.